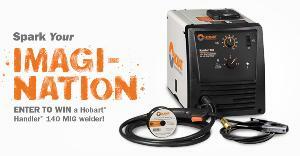 Contest: WIN: Hobart Handler 140 MIG wire feed welder! WIN: Hobart Handler 140 MIG wire feed welder! Prize: PRIZES: One (1) Hobart Handler 140 MIG wire feed welder – value $569.99 USD. Statistics: This contest was opened by 160 and entered by 27 ContestChest.com members. 17% of those who opened the contest, entered it.